It is the energy of an object due to the virtue of its position, configuration and orientation. It is denoted by 'u'. 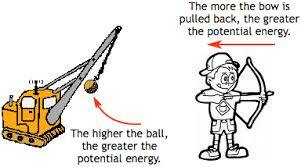 There are various types of potential energy. Water stored in dams contain potential energy. 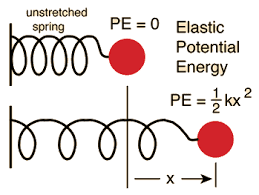 Elongated or compressed spring also has potential energy. 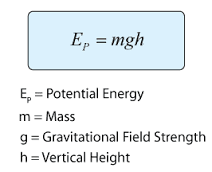 Objects placed at a height contain potential energy. Two charged particle separated at a distance contain potential energy. u is the potential energy. h is the height of an object. It is directly proportional to the mass of the object. It is directly proportional to the height of the object. It is directly proportional to the acceleration due to gravity. It is the energy related to spring or elastic chord.